This app helps you to burn fat, get abs and keep your abs. The app contains the ten most common abs exercises everyone can do. Perform 10 exercises everyday to get 6 pack abs. Doing the workout will make you feel stronger, healthier, improve energy and control weight. Exercise benefits every part of the body. You don’t need any equipment for the workout. Complete daily ab workout with log. The daily workout routine contains basic crunches, alternate heel touches, leg-up crunches, arm reaching crunches, flutter kicks, leg raises, V crunches, bicycle crunches, vertical leg crunches and plank with leg lift. If you don’t train this is the perfect app for you. 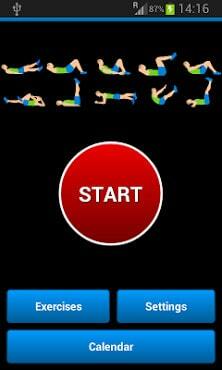 Get abdominal muscles with this fitness app. Do it everyday to get fast results.